The inauguration of Barack Obama in 2009 came with high expectations over the U.S. role in confronting global climate change. “This is the moment when we must come together to save this planet,” said the then presidential candidate before a 200,000-strong crowd in Berlin, Germany, in July 2008. Weeks after his election that November, president-elect Obama pledged that his administration would mark a “new chapter in American leadership on climate change.” As president, his 2010 national security strategy would elevate climate change to the U.S. defense agenda, warning that it poses a “real, urgent, and severe” danger. In September 2010, President Obama announced the Global Climate Change Initiative, joining Feed the Future and the Global Health Initiative in the administration’s series of core global development programs. Just recently, the U.S. Agency for International Development released its climate change strategy that lays out agency priorities and activities through 2015. The USAID strategy document asserts that climate change is “expected to exacerbate existing development pressures” and helps to explain the Obama administration’s renewed emphasis on countering the effects of climate change. From shrinking global food output to triggering instability in fragile states, most analysts believe that the impacts of climate change could reverse development gains across the globe. USAID also concedes that it is the poor in developing countries that will be hardest-hit. In 2007, the Intergovernmental Panel on Climate Change predicted continuing global GDP losses of 1 percent to 5 percent if climate change is left unabated. GCCI aims to “foster a low-carbon future and promote sustainable and resilient societies.” Programming is organized around three pillars: (1) climate change adaptation, (2) clean energy, and (3) sustainable landscapes. Climate change adaptation programs aim to assist low-income countries in reducing their vulnerability to climate change impacts. Clean energy programs aim to reduce greenhouse gas emissions from energy generation and energy use by accelerating the deployment of clean energy technologies, policies, and practices. Sustainable landscapes programming aims to reduce greenhouse gas emissions from deforestation and forest degradation. President Obama’s proposed $1.3 billion GCCI budget for 2012 allocates 19 percent for climate change adaptation, 49 percent for clean energy, and 32 percent for sustainable landscapes. In addition to making investments in these three areas, GCCI also intends to integrate climate change considerations into other relevant U.S. foreign assistance programs. Excluding regional and multilateral programs, for 2012 the Obama administration has requested funding for 44 countries in Africa, Asia, Latin America and the Caribbean, and Eastern Europe. According to the U.S. government, it selected these countries based on criteria linked to each GCCI pillar. 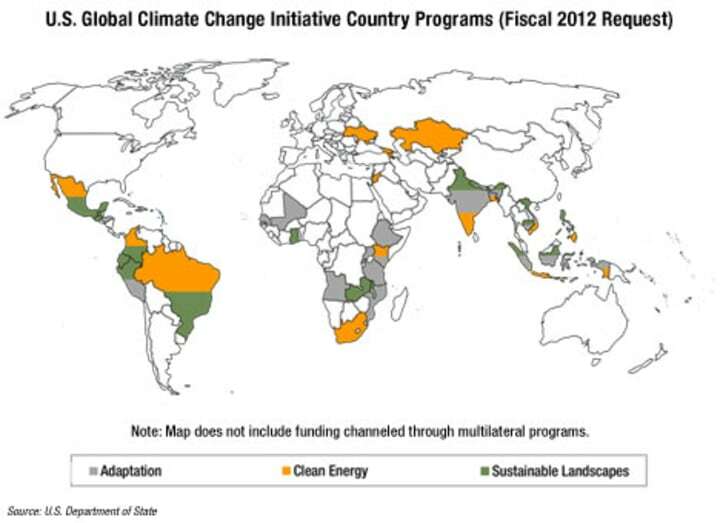 For adaptation funding, the U.S. prioritizes countries most vulnerable to climate change impacts. Clean energy assistance targets countries with the potential for both emissions reduction and renewable energy development. Lastly, countries with high-priority forest landscapes qualify for sustainable landscapes assistance. Only four countries, all in Asia, are slated to receive GCCI funding in each of the initiative’s three pillars: India, Indonesia, the Philippines and Vietnam. In January 2011, USAID appointed a global climate change coordinator, responsible for harmonizing climate change programs across all bureaus in the agency. Both USAID and the State Department, which spearhead bilateral programs under GCCI, have reportedly begun training staff on climate change issues and practices, building internal expertise and empowering those responsible for implementing climate change programming. The announcement of GCCI back in 2010 appears to have prompted a flurry of climate change-related development activity. Based on Devex data, U.S. climate change-related tenders nearly doubled from 2010 to 2011. In 2011, USAID issued 72 percent of the tenders, followed by the Millennium Challenge Corp. at 16 percent and the State Department at 12 percent. But with the presidential election forthcoming and foreign aid still on the chopping block in Washington, it remains to be seen if GCCI can establish the necessary momentum into 2012 and beyond. GCCI lacks the bipartisan support that President Obama’s other development priorities, food security and global health, have enjoyed over the last decade. These programs are easier for U.S. lawmakers and voters to get behind because they tend to produce shorter term and more observable results. At the same time, Republican leaders still openly question the existence of global warming; arguing that more scientific study and proof is needed and polls reveal that nearly half of all Americans consider worries over climate change to be exaggerated. Clearly, this is not the easiest environment for climate change proponents to make their case and attract funding in the longer term. There are several other outstanding questions surrounding GCCI and the future of U.S. climate change programming. Devex answers some of them here. Is there enough money to go around for GCCI? President Obama’s $1.3 billion GCCI budget request for fiscal 2012 represents about a four-fold increase in funding from 2009. This falls in stark contrast to the administration of President George W. Bush, which oversaw a 7 percent decline in annual climate change spending during its time in power. While Congress has already cut the fiscal 2012 request by at least $330 million, President Obama is still on track to fulfill his 2009 Fast Start pledge of $3 billion from 2010 to 2012 – enough to propel the U.S. to the position of second largest bilateral climate change donor. During the 2009 U.N. Climate Change Conference in Copenhagen, the U.S. and other donors pledged $30 billion in Fast Start Financing from 2010 to 2012 with the objective of instilling confidence in international climate change negotiations. U.S. Fast Start commitments now largely fall under the umbrella of the GCCI budget. Click here to view image in large size. Notwithstanding America’s significant Fast Start commitments, some believe that America’s $3 billion commitment is still well below the country’s fair share which they peg at 20 percent to 30 percent of the total $30 billion pledged in Fast Start aid. Moreover, by most accounts, the U.S. and other Fast Start commitments are far from enough to meet the climate needs of developing countries. Climate research initiative Project Catalyst estimates that developing countries will require $126.3 billion annually in climate aid through 2020. Foreign aid donors and the global development community are also struggling to balance mitigation and adaptation spending and the U.S could help. A consensus emerged in Copenhagen that mitigation activities, which are designed to reduce emissions, have received a disproportionate share of funding at the expense of adaptation activities which help developing countries cope with climate change impacts. In 2010, the World Bank estimated that donors allocated less than a tenth of climate aid for adaptation. In the 2012 GCCI budget request, President Obama allotted 19 percent for adaptation activities, nearly tripling adaptation spending from 2009. According to the International Institute for Environment and Development, however, Fast Start adaptation pledges from various donors average between 19 and 25 percent of total climate aid spending which puts the U.S. at the low end of that range. Climate advocates have called on the U.S. to focus more resources on adaptation and further rebalance Washington’s climate aid portfolio. Looking beyond Fast Start, in Copenhagen global donors pledged an additional $100 billion in annual climate aid by 2020, but the U.S. has not yet set its target contribution or articulated a strategy for meeting it. A 2010 report by a U.N. advisory group charged with studying potential sources of financing to meet the Copenhagen commitment suggested financial transaction taxes, levies on shipping and aviation, and carbon allowance auctions as options, some of which have been considered by Congress, as well as the Obama administration. President Obama’s marquee global warming legislation, which only narrowly passed the House, would have set aside up to $5 billion a year in revenues from a “cap and trade” emissions trading scheme for U.S. climate aid. Today, it appears that Obama has backed away from the scheme, seemingly aware of its bleak prospects in a tight budget environment and Republican-controlled House of Representatives. How can GCCI leverage multilateral partnerships? 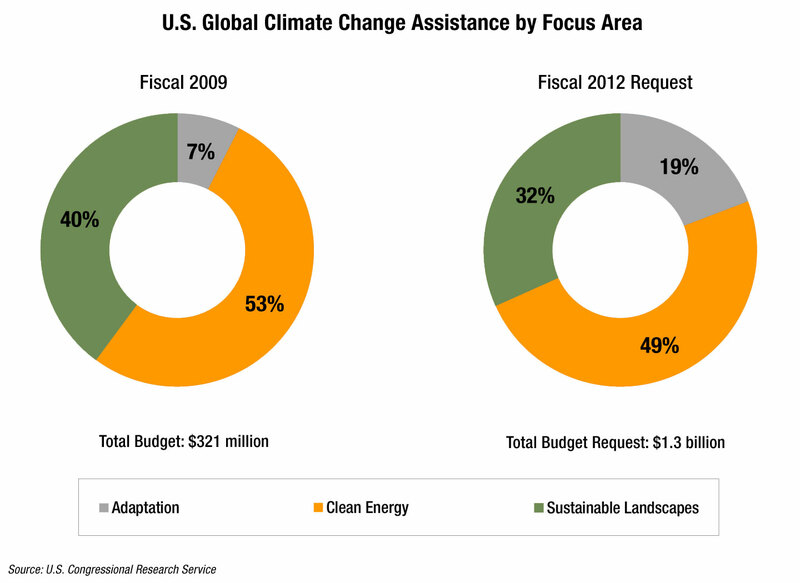 U.S. climate change aid has taken on a decidedly more multilateral character under the Obama administration. President Obama’s proposed 2012 budget allocates over half of GCCI funding to multilateral programs, up from just 17 percent in fiscal 2009. Much of this shift can be attributed to American contributions to the World Bank-administered Climate Investment Funds, created in 2008, which were designed to help finance developing country transitions towards low-carbon and climate-resilient development. 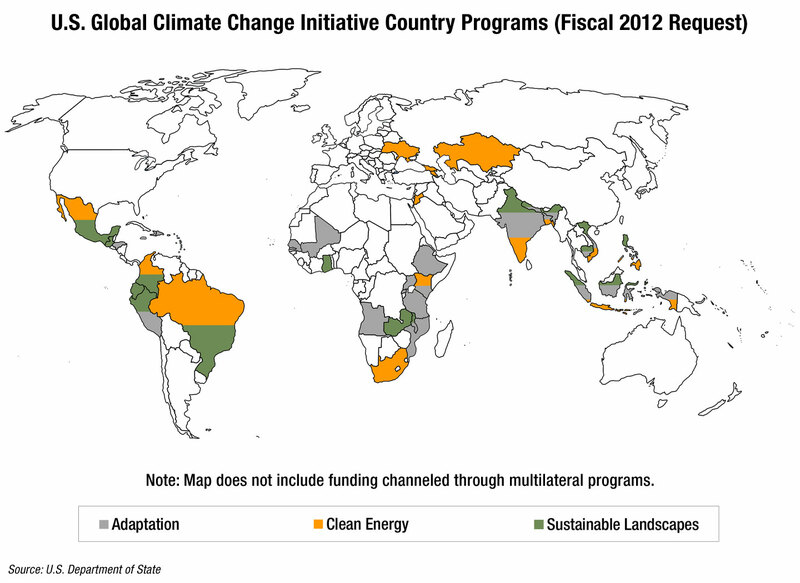 U.S. climate aid also continues to flow through other multilateral channels including the Global Environment Facility – an independent financial organization which provides environmental grants to developing countries. During replenishment negotiations for GEF in 2010, the Obama administration secured policy reforms that aim to improve the Facility’s overall effectiveness. In a similar vein, climate advocates now hope that the U.S. will go beyond contributing to the World Bank-administered climate funds and utilize its shareholding power within the Bank to influence its broader lending. Climate advocates were relieved when U.S. negotiators at the Durban conference in December eventually signed off on an agreement defining the broad design of a U.N. guided Green Climate Fund. With a mandate to manage a “significant share” of multilateral climate aid, the Green Climate Fund has the potential to streamline and even supersede most multilateral climate initiatives. At the bilateral level, the Obama administration has pursued efforts to coordinate its climate change programs with leading donors including the European Union, the United Kingdom and Australia. Most analysts agree that next steps should include harmonizing efforts across the global climate aid architecture at both the bilateral and multilateral level, moves that will inevitably require U.S. backing. The fact that there are reportedly 19 schemes for climate adaptation aid is but one illustration of the fragmentation and lack of coordination across the global climate change establishment. How can prospective private sector partners do business with GCCI? GCCI is beginning to deliver business opportunities for a wide variety of private sector partners that can help implement the array of climate change programming. In September 2011, USAID solicited proposals for a contractor to assist in deploying clean energy technologies and systems in India. Earlier last year,USAID sought partners for a project in the Mekong River basin to help local communities develop adaptation plans, tailor-made for a consulting firm or institute with climate expertise. Devex has also observed that firms with climate knowhow have begun to gain a competitive advantage on bids that may fall outside of GCCI and lack an explicit environmental objective. One such case is a Millennium Challenge Corp. tender for a Water, Sanitation and Hygiene Project in Cape Verde which specified climate change impact assessment as a service that bidders must be able to deliver. One “big idea” highlighted by many aid practitioners is micro-insurance. This range of customized, market-based insurance products has been widely credited with helping protect smallholder farmers and their crops against extreme weather events. In October 2011, USAID announced a three-year partnership with reinsurance giant Swiss Re to expand access to micro-insurance in the Americas, Africa and Asia. Showcasing the inextricable link between climate change and other aid priorities, both GCCI and Feed the Future will be overseeing the partnership on behalf of USAID. A survey of 72 companies published in a joint 2011 report by the U.N. Environment Program and the World Resources Institute found that that a lack of information often inhibits businesses from pursuing opportunities in climate finance. The same report argues that governments can play a pivotal role in closing these gaps, but it appears that the U.S. is slightly behind the curve. While both Feed the Future and the Global Health Initiative have websites with dedicated pages for potential partners, GCCI still lacks its own online presence. 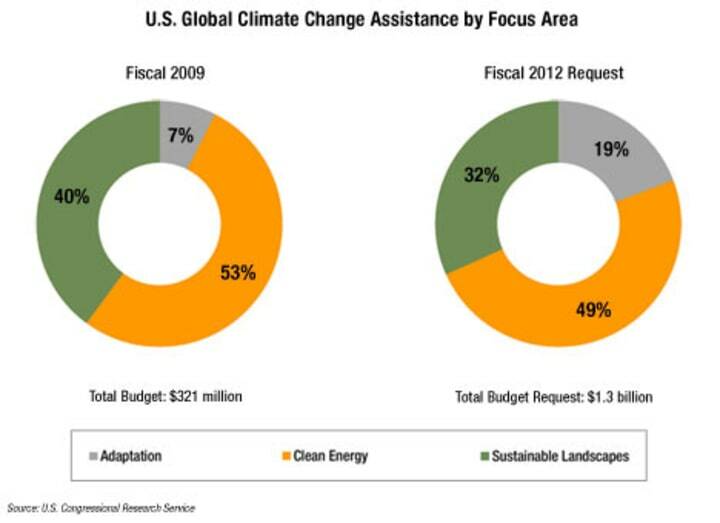 Are there any other important climate change-focused funding streams? While outside the congressionally-appropriated GCCI budget, there has been a recent jump in financing through the Overseas Private Investment Corp. This is a development worth watching for firms interested in doing climate-related business with the U.S. government. OPIC private sector financing (loans, guarantees, and political risk insurance) is designed to mitigate risks for overseas investment, with a focus on the Middle East, sub-Saharan Africa and South Asia. In fiscal 2011, OPIC’s climate commitments hit a record $1.1 billion, concentrated in clean energy investments, a priority sector for OPIC. The proliferation of energy efficiency mandates in emerging markets, a potential cash cow for renewables firms, has been cited as a major contributing factor behind this surge in demand. In fiscal 2008, OPIC climate financing stood at only $10 million. OPIC is also emerging as a leader in impact investing. Among OPIC’s 2011 commitments was $40 million for a private equity fund that, it says, will catalyze $100 million for forest protection from impact investors. This fast-growing community of lenders aims for their investments to yield social and environmental benefits in addition to a financial return. OPIC’s $250 million pledge to support impact investing earlier in 2011 represented the U.S. government’s largest-ever commitment to support the fledgling industry abroad.